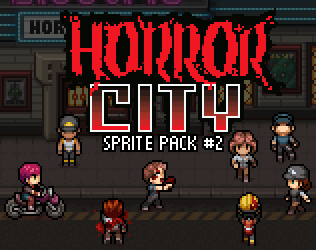 Add some cute, grungey character to your horror games with the Horror City Sprite Pack #1! This sprite pack includes various characters, facesets, zombies, vehicles and more, lovingly created in my POP! graphic style. 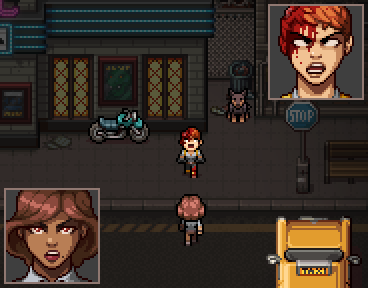 Featuring classic Survival Horror inspired designs for a throwback 90s vibe! Also included are a sheet of service dog sprites and motorcycle riding characters! Arranged in both 16x16 and 'plug and play' 32x32 RPG Maker VX Ace versions for ease of use. Also included are base sprites in various skin-tones and body shapes allowing for the creation of your own heroes and heroines - or perhaps you'd rather just make more undead hordes? The choice is yours! Survivors, zombies, vehicles, power-ups and more - bring your horror games to life and undeath with these adorably disturbing horror sprites! Please note: Some of the graphics contained in this pack have previously been made available as part of my POP! 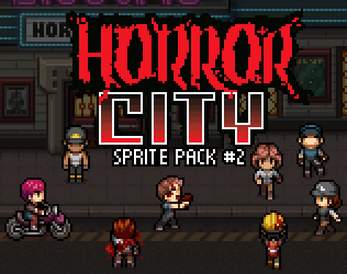 Horror City graphic packs for RPG Maker, available on Steam and via the official RPG Maker Web store - however, this is the first time these graphics are available as part of a Non-RPG Maker license, allowing them to be used in any game creation engine you like! Check out my other work here! Or follow me on Twitter for more cool stuff! Hello I was wondering if the movie theater chip set tiles from the background in the pictures were available somewhere or planned to be? Your work is pretty awesome! How is it going with the four directional shooting sprites? I would put that in the description for people buying this thinking it has them. That is the only thing missing from this series. Really depends on your tools, you can use photoshop or if you use unity just set the image to sprite/ui then select multiple type, then you can just grab that one graphic in the ui image. This question is way too open ended, but the answer will always be yes. Hey! In the picture above there is a sprite holding a gun, but its not actually in the pack. Is there anyway to get a couple weapons (gun, knife) in the 4 sprite directions? Just something we can place over the sprite? I'd be happy to purchase it as an additional pack as well (already own all your other packs). Hi there! I'm not sure I'm seeing what you're seeing, as there are no sprites holding any guns in the screenshots for this pack. Opps, you are correct. Its a zombie holding blood. Just glanced at it. We are planning to purchase your work next week but we need to present the characters the day after tomorrow. So my question is can we use the previews of your work posted here in our game presentation? Hey there, if you're just using the screenshots for presentation purposes that's fine - so long as no claim is made that you own or have created the content. Hope that helps.